Need ideas for outdoor STEM challenges for the end of the year or summer time? My students always get restless as the weather warms up, so we take STEM outdoors! 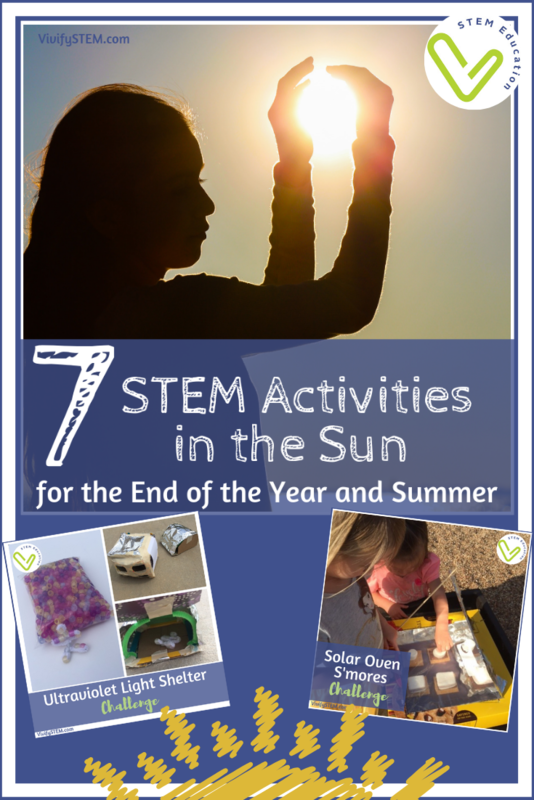 From a UV light shelter to a s’mores solar challenge, read on for awesome STEM outdoor activities using the sun! Use the engineering design process to protect an astronaut from ultraviolet light! Did you know that astronauts can be exposed to dangerous levels of ultraviolet (UV) light in outer space? We use this real-world scenario to ask students to design a UV shelter to protect their “astronaut” from harmful rays. The activity uses common materials along with these awesome ultraviolet sensitive beads. First, test different building materials to determine which ones prevent UV light from reaching the beads. Students will then use ultraviolet sensitive beads and pipecleaners to build an astronaut (directions provided in the guide), and then using the engineering design process to build him/her a shelter for protection. If the sun is not out, you can use a black light for the same effect. This activity is a great way to get out doors and learn while having fun, and it may also motivate your kids to wear sunscreen for their own protection! 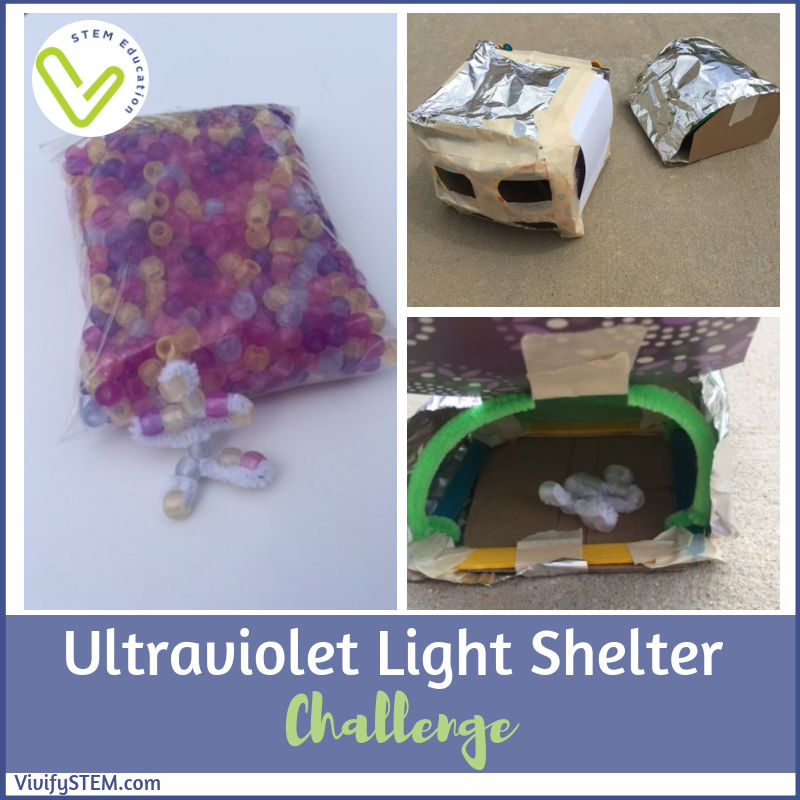 The complete activity guide can be found here - UV Light Shelter Challenge. Rub different sunscreens on a sheet of transparent film, like an empty laminated sheet. Take it outside and see which sunscreen blocks the most UV rays! Make a protective suit for your astronaut when he/she leaves the shelter. Can you make a helmet that he/she can still see through but will provide protection? Conduct this challenge at the end of the school year in your classroom for practice with engineering, science and math! For more great end-of-year STEM activities, head to STEM Activities For Kids for a fantastic list of resources from top STEM educators! Design and build a solar oven to make s’mores with this engineering design challenge! Grab a pizza box or something similar, and cut a square flap in the lid (with one side still attached) and put foil on the inside. Angle the flap so that it reflects the sunlight into the box. Add plastic wrap to the part of the box where you cut the flap to keep dirt and bugs away from your food! Inside the box, layer a graham cracker, chocolate square and a marshmallow. Leave outside to cook. Cooking time varies! A great extensions it to measure cooking time for different days as well as measure the temperature inside the box. You will add the graham cracker top once the s’more is heated to your liking. Enjoy! You can do this at home or in the classroom (with access to the outside) using our engineering design challenge guide here! This guide walks students through the engineering design process to create their own solar ovens to optimize the cooking of their s’mores. This is a yearly favorite for my kids! Ready for more learning fun in the sun? Check out these other cool ideas you can do to learn from the hot ball of gas we all love! Solar Cars can be used to explore the technology involved in using sunlight for energy. Discuss ways to store light energy and how it is used as a clean energy source. Sci Journal app- Use the ambient light sensor to investigate the Sun’s light and compare it to artificial light sources and even light present in shadows. Make Sun prints- Take construction paper outside in full sun. Place objects like pennies, leaves, or toys on top. Leave it there for at least 4 hours, making observations about the changing paper color as time passes. The ultraviolet rays fade the paper that is exposed while the parts of the paper covered by opaque objects retains its color. What color paper fades the most? Hypothesize why— is it related to how much that color absorbs sunlight? Enjoy your time doing STEM in the sun! Explore the power of the sun with science and engineering activities by Vivify STEM. **Vivify LLC is a participant in the Amazon Services LLC Associates Program, an affiliate advertising program designed to provide a means for us to earn fees by linking to Amazon.com and affiliated sites. This post contains affiliate links.